EMMANDUS INSPIRATIONAL NETWORK! 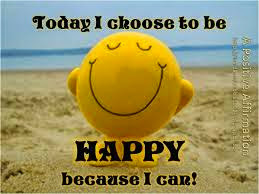 : CHOOSE TO BE HAPPY! he responds to them. He can choose to be reactive or rather proactive. Effective people in every field are proactive in the face of life's challenges. Choosing to be happy is a proactive approach to life. While you might not be able to fore tell the outcome of an event with absolute precision, God has given you absolute power and this power is an extension of your ability to choose how you will embrace change and confront the challenges headlong. Remain unperturbed by the happening of life, your mind is a treasured garden you will constantly guide from the weeds of bitterness, staying happy a recipe to keeping this weeds out and away. If happiness were a choice, wouldn’t you rather choose it now and again? Well, Happiness, sure is a choice. Some bold confessions might be very useful in times when you are at low ebb. It is a sure way of keeping things in track again. When you choose to be happy you take back your power! I CHOOSE TO BE HAPPY NOW AND AGAIN ! I CHOOSE HAPPINESS EVERY DAY! I CHOOSE TO BE HAPPY NOW AND ALWAYS! I AM A TREE PLANTED BY THE RIVER SIDE BEARING THE FRUITS OF HAPPINESS IN ABUNDANCE!